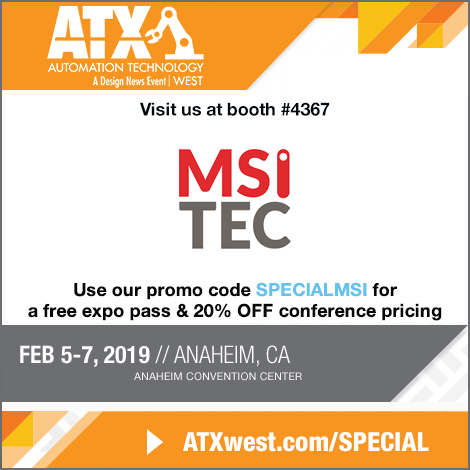 Meet MSI TEC at ATX West – Booth #4367! Products on display from Moxa, Omron, eWon, Robotiq, Universal Robots & more. Drawings throughout the day for an Amazon FireTV Stick & Echo!! Engineers on hand to answer questions or discuss your project. ATX West takes place February 5 – 7 in Anaheim, CA and features an expanded conference program, expert-led sessions, networking activities, and educational hubs to keep you at the forefront of the industry. Your badge gives you access to four additional expos spanning medtech, smart manufacturing, plastics, and packaging components and technologies — all on one floor. Click here to view the tradeshow floor. Visit the MSI TEC ATX page here. Get a free expo pass! Visit http://ATXwest.com/SPECIAL and use our promo code SPECIALMSI.